IronCAD Inovate is available in US, MX & Canada, and it usually ships within 1 or 2 working days. IronCAD Inovate is covered by the Novedge Best Price Guarantee. 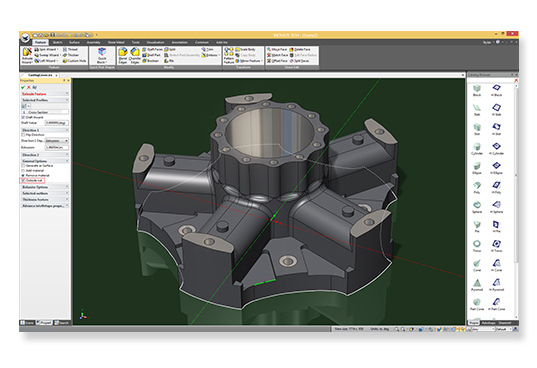 IronCAD Inovate is cost-effective 3D CAD software that bridges the gap between today's viewer technology and a full-blown CAD seat. Enabling true upstream and downstream design collaboration, IronCAD Inovate allows users across an organization to create, modify, and share design concepts in 3D, ensuring that all stakeholders are fully involved before taking the next step toward production. IronCAD Inovate is equally at home working with existing models which can be imported, interrogated, modified and communicated to others either as models, photo-realistic images or real world animations. IronCAD Inovate is the most complete way to collaborate in 3D. New capabilities have been added to enhance graphical interaction with large data sets to boost performance in ranges such as 10x increase. IronCAD Inovate provides the ability to add realism to designs using the Smart Paint settings for such things as reflection, textures, decals, etc. However, these settings can impact the overall performance when dealing with large data sets. In the background settings under realistic, dynamic mode, a new option has been added for Simplified Model Surface Display which will optimize IronCAD rendering performance. When dealing with large data sets, new options in the mechanism mode are available to improve the performance so you can test the range of motion of your designs. Controls have been added to limit the collision detection to the dragging object and/or the moving objects. This reduces time attempting to calculate the entire modeling environment for collision. A new utility to simplify models for securely sharing designs has been added to the Assembly Ribbon bar. Specify critical parts/assemblies to keep, what to remove, and size settings for hiding parts, assemblies, and holes and click OK. The utility will process the model and generate a simplified ICS file that is reduced in size and that can be shared with collaborators. Share your designs across any device with our new 3D Web Viewer, which supports viewing and tree navigation in any browser supporting WebGL. Export designs to a local drive or save to a web server location to share the lightweight graphical model with colleagues and collaborators. IronCAD's core systems have been updated to support the latest improvements in the modeling, solving and Native Translators. With the latest release of the IronCAD DCS, you will have access to the following versions of CAD file formats using our Native Translators. New improvements have been made to streamline the user experience. One example is when creating a sketch in an empty scene, in one click the command will create a sketch in the scene ready for you to work instead of entering various placement options. In addition to the sketch creation improvement, Features such as Extrude and Spin will be streamlined to start with the sketch in the scene without entering the placement options. It is common to position features once in place on parts. To streamline the process, we have automatically added reference dimensions to the nearest planar face edge. To enable this option, go to Tools/Options/Interaction and enable the command "Automatically add position dimensions on dropping features." Improvements have been made to the previous "S" key command structure to be visible full time to give users access to commands in the design space, reducing mouse travel and need-to-know hidden commands. Click on the setting command at the top of the circle to access additional settings or to customize the commands. When the Quick Commands appear, simply move outside of the circle to make it disappear or hit the "S" key on your keyboard to make it disappear/appear. 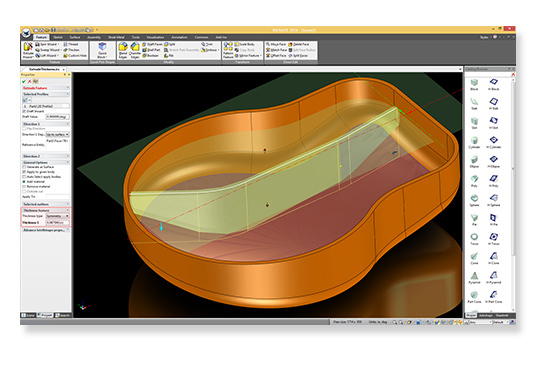 Patterning parts typically creates a BOM of a single line item with multiple instances. In some cases, you may want to call out the parts individually, which is now possible with the new setting for automatically generating numbering for patterns. This setting can be found on the TriBall Pattern capabilities. To streamline the drawing view projection process, users can now select and define the front view direction on parts versus using IronCAD's default determination. This is useful for setting up proper view orientations in your drawings without worrying about the orientation of the part in the scene. This setting can be found in the right-click menu on a part labeled "Front View Definition." Using the "Create Multiple Instances" with the TriBall, new options are available to "Copy/Link to Point/Center Point." During this command, use the standard "Shift key-Click" on arcs/circles to snap to the center at multiple locations in one command. In the parameter table, a new control has been added to help input formulas. For example: Adding an "If/else" statement allows the input of values so the control will format the statement automatically in the expressions. Further improvements from 2017 PU1 SP1 have been made to simplify the installation process and to make it clear to new users. Better process for updating an existing dongle for the new version licenses. The Tools/Options dialog has been improved to support better navigation within the dialog and to support more options. IronCAD Inovate is cost-effective 3D CAD software that bridges the gap between today's viewer technology and a full-blown CAD seat. Enabling true upstream and downstream design collaboration, INOVATE allows users across an organization to create, modify, and share design concepts in 3D, ensuring that all stakeholders are fully involved before taking the next step toward production. Featuring a radical drag-and-drop 3D environment, IronCAD Inovate delivers unmatched ease-of-use to speed up conceptual design and involve more stakeholders in the process. INOVATE also imports standard file formats — such as ACIS, Parasolid, IGES and STEP — and exports to those same file types so that stakeholders using other 3D CAD software can fully participate in workflows involving INOVATE. Use INOVATE TRANSLATOR to even import Native file formats to extend your capabilities. IronCAD Inovate makes 3D models and engineering project data available to marketing, sales, and training teams so they can work together and communicate more effectively. 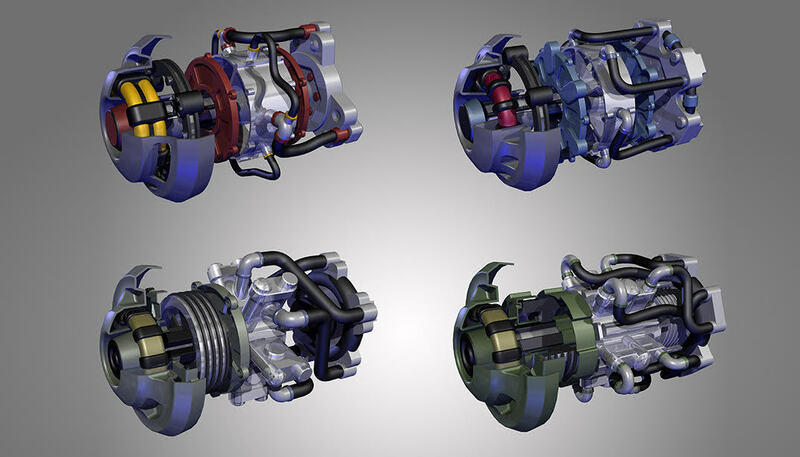 Use INOVATE 3D CAD software to create 3D concepts and animations and then import those into marketing, sales, and training materials, extending the use of 3D models and data beyond just the engineering department.